We are based about 30 minutes outside of Philadelphia in Voorhees, NJ. We will travel throughout New Jersey, eastern Pennsylvania, or parts of Delaware for the right event. Osteopathic Entertainment believes in good, clean fun. This means that we reserve the right not to play music with explicit lyrics for certain audiences. Please hire someone else if you want music that strongly advocates violence or degrades other human beings. Osteopathic Entertainment is a registered and insured Professional Mobile Disc Jockey company. Don't trust your event to anyone but a professional. 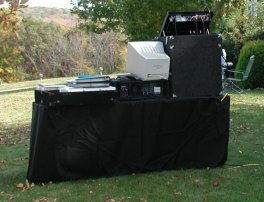 If you live outside our coverage area, please check www.FindYourDJ.com or www.WeDJ.com for a professional disc jockey in your area. Our music library contains over 800 CDs from the big band era through today's hottest radio and club music. We use the best Denon CD players, high quality Numark mixers, Crown amplifiers, ElectroVoice speakers, and we top off our setup with table and tripod coverings by DJ Skirts. For the long version of our story, please click here.